The author is a dairy scientist and serves as president of the William H. Miner Agricultural Research Institute in Chazy, N.Y.
Grasses contain more potentially digestible fiber than legumes, but they need to be harvested early to capture the benefit in milk production. Whether in pure stands or in alfalfa-grass mixes, there is a “point of no return” when the goal is harvesting high-quality forage for dairy cows. Research shows that neutral detergent fiber (NDF) digestibility for grasses can decline by over 1 percentage unit per day. So, a delay of several days in harvest can make a potentially great crop only mediocre or worse. Legumes typically have more fragile NDF than grasses, and their particle size declines more rapidly with chewing. Grasses naturally break into long and slender pieces when chewed compared with legumes. Longer forage particles with grass-based diets create a dense rumen digesta mat that slows the passage rate of smaller particles from the rumen, promotes greater rumen fill, and boosts the mass of physically effective NDF in the rumen. Essentially, longer forage particles in the rumen act as a filter and slow passage of particles that are otherwise sufficiently small and dense enough to escape. High-producing cows with greater appetites and higher dry matter intake will be more quickly limited by rumen fill when consuming average or low-quality grasses compared with legumes. Legumes ordinarily have a 15 to 20 percent greater initial rate of NDF digestion versus grasses, but the extent of NDF digestion is 30 to 40 percent greater for grasses reflecting 30 to 40 percent less lignin. 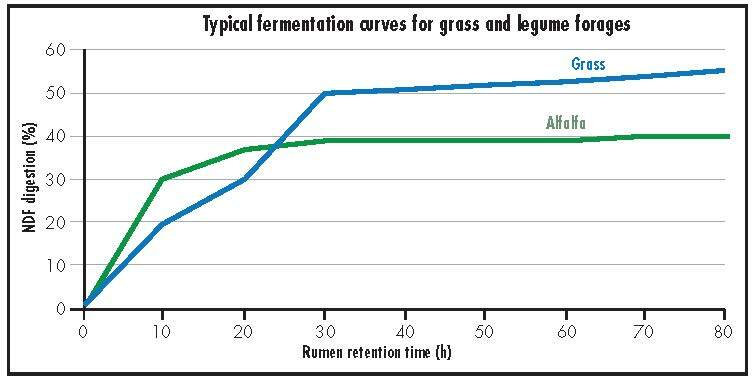 The figure depicts the average fermentation curves for grass versus legume forages. For average grasses and legumes, the rumen fermentation curves cross at approximately 20 to 30 hours. Beyond this time frame, the inherently greater extent of NDF digestion in grasses should be a nutritional advantage. 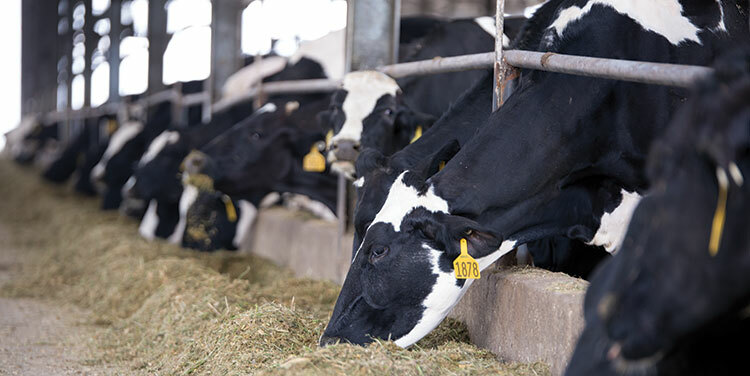 An important consideration is the average time that a forage particle spends in the rumen in comparison to the point when grass NDF digestion exceeds that of legumes. If rumen residence time is too short, then the greater extent of NDF digestion for grasses will be of relatively little use to the cow. Research conducted at Miner Institute indicates that the mean rumen retention time for marked hay crop silage and corn silage of medium length (1.18 to 4.75 mm) is approximately 35 to 45 hours for cows consuming about 60 pounds per day of dry matter and producing about 100 pounds per day of milk. Mean retention time for small forage particles (less than 1.18 mm) is about 30 to 35 hours. The inference of this research is that highly productive dairy cows can effectively use grass forage as a source of fermentable NDF. The retention time in the rumen is sufficiently lengthy that the greater extent of NDF digestion of grasses can be effectively exploited. But grass needs to be harvested at earlier maturities with less lignified NDF to enhance NDF digestion rate and extent of digestion. The impact of greater NDF digestibility on dry matter intake and milk production can be tremendous. Consider the example of a 1,400-pound dairy cow eating a diet with a forage blend of 25 percent alfalfa (40 percent NDF) and 75 percent grass (55 percent NDF). When the 48-hour NDF digestibility of the grass is only 60 percent, then cows producing about 90 pounds per day of milk can eat 52 pounds per day of a diet containing just 54 percent forage. But, when the NDF digestibility jumps to 76 percent, then the dietary forage percentage can increase to 63 percent while maintaining feed intake and milk production. Grass must be harvested at early maturity when there is less lignification and fiber digestion rates are greater. The table contains forage quality information from Dairy One Forage Lab summarized by Larry Chase at Cornell University in 2012. The normal range in 30-hour NDF digestibility for grass forage is about 55 to 70 percent (normal range is defined as the average plus or minus one standard deviation). In order to capture the benefit of grass’s greater fiber digestibility, we need to target the upper end of this range to maximize cow productive response. Current recommendations on when to cut your forages often use alfalfa to decide. Research at Cornell University by Jerry Cherney suggests that the height of alfalfa predicts when it and grass fields, in your local climate and conditions, should be cut. When alfalfa near a grass field is about 13 inches tall, then it is time to cut pure grass stands. If alfalfa is mixed 50:50 with grass, then cut when alfalfa is about 23 inches tall. Of course, variation exists among the various grasses available, and the key is to harvest early — when 30-hour NDF digestibility is close to 70 percent. Don’t wait to cut mixed stands until the alfalfa is ready. You will end up with grass that is too mature and will limit dry matter intake and prevent your cows from reaching their genetic potential. This article appeared in the March 2017 issue of Hay & Forage Grower on pages 16 and 17.